In a busy household, your family’s entrance is probably one of the most high-traffic parts of your home, especially if you live in a cooler climate or have kids with an active schedule. Whether your family mostly uses your home’s main entrance or a side door or mudroom, having well-made furniture with lots of built-in storage can not only help you clear up the congestion, but also help get rid of some of the clutter. In fact, good storage benches will give you all the space you need to stow everything from hockey equipment to winter coats and look good doing it. It’s customary to have some kind of storage near your family’s main entrance, whether it’s a simple coat rack, a mail sorter, or even just a hook for key rings. But if the stuff you need to store is bulky – like sports equipment or heavy winter gear – a few small hooks probably aren’t going to cut it. 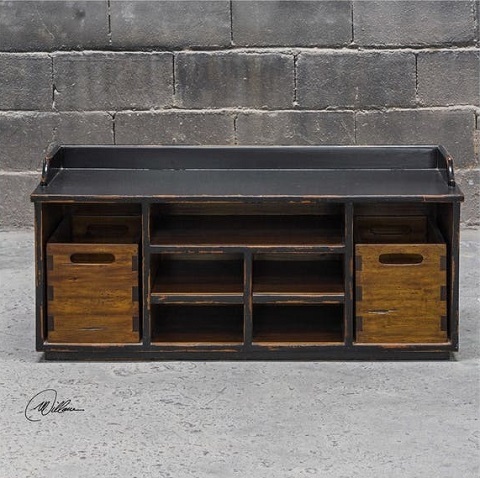 Instead, you want to look for something with a slightly higher capacity, like a storage bench with seats that lift up to reveal a large cabinet underneath. Storage benches are doubly good for entryways or mudrooms where you spend a lot of time getting in and out of winter or sports gear, since they give you a convenient place not only to stash your snow shoes, but also somewhere to sit while you pull off your cleats. It might seem like a small thing, but having a durable, sturdy spot to sit can make a world of difference – especially when you’re tromping in out of the snow and wind. As a bonus, with wood storage benches you won’t have to worry about damage from snow or mud the way you would with upholstery. If you’re less worried about packing up padding and parkas and more concerned with keeping track of shoes, accessories, and odds and ends that you might want to grab on the go (like sunscreen, bug spray, water bottles, snacks, and so on), you might want to look for cubby-style storage benches instead. Rather than a conventional trunk-style design, these are segmented into smaller cubes and rectangles and are great for stashing smaller items – from big storage cubes you can dump your scarves in to individual shoe-shelves that keep shoes from piling up in your entryway. Admittedly, in a lot of ways, storage benches occupy the same functional space as trunks. And really, a vintage steamer trunk (or something similar) can make a great statement piece in an entryway: they work well for long or short term storage, and you can sit on them just about as well as any bench. 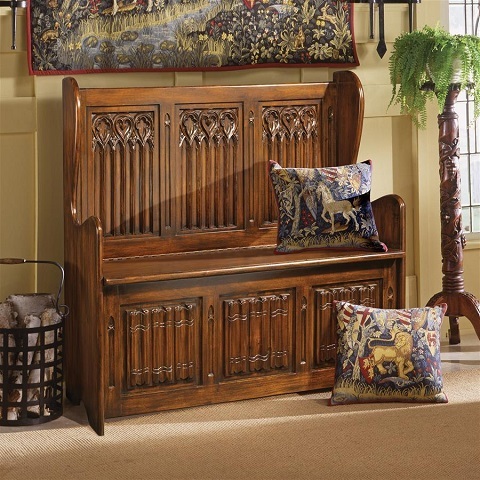 That said, lots of decorative storage benches really take the look to the next level, with beautiful medieval and Gothic inspired woodwork that will really give your space a polished, ornate feel (which can help counteract that pile of ballet shoes and sneakers!). 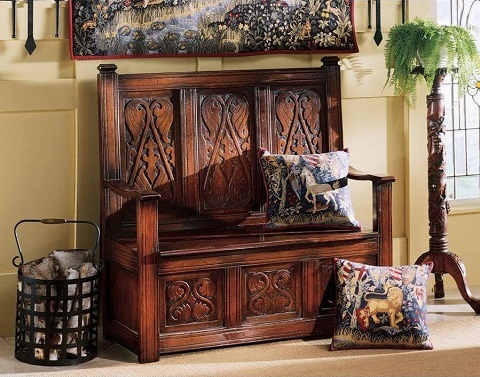 Storage benches can also have more of a regal appeal, especially when you start to drift into hall stand territory. 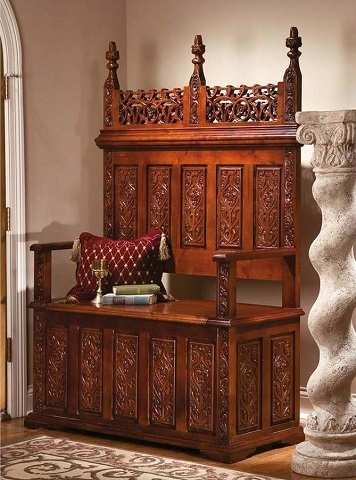 The main difference between the two is that storage benches are primarily benches – with seats and backs and arms, plus storage inside – whereas hall stands come in a wide variety of shapes and sizes, with lots of different types of storage, from coat hooks and hat racks to mirrored jewelry storage, drawers, cubbies, and shelves. They’re less likely to have under-seat storage than storage benches, but are a little more customizable in terms of other storage; the wide variety of styles and configurations makes it possible to find just the right one for your needs. One main feature of hall stands and hall trees that storage benches generally lack is the inclusion of a mirror in the design. 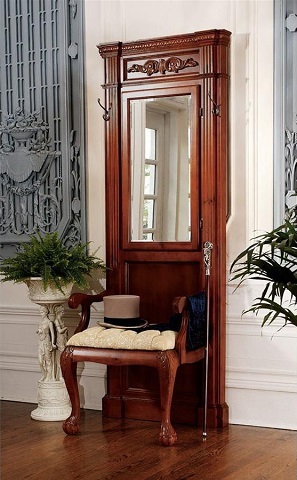 Hall stands can have anywhere from a small round mirror to a full-length one built in, and are designed that way so you can check your reflection on the way out the door. 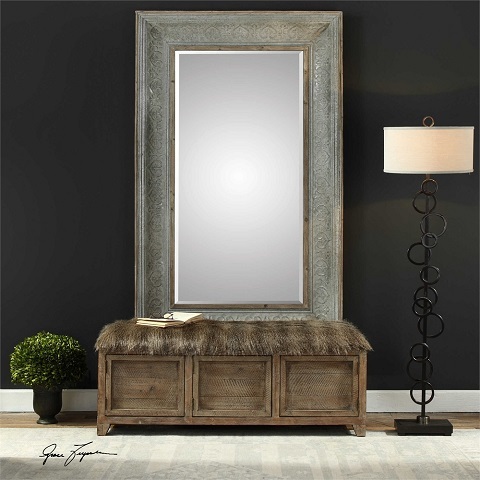 The good news is, it’s relatively simple to supplement a storage bench with a mirror – either one hung above the back of the bench, or if you have a backless bench, you can even place or hang a full-length mirror just behind it. Finding the right type of furniture for your family’s main entrance can make a huge difference in the usability of the space – and how fast you can get out of the house when you’re in a rush. Depending on your needs, some types of storage might be better than others, but if you have a high volume of items, you really can’t beat a storage bench in terms of capacity. This entry was posted in Decorating Ideas and Tips, Furnishing Ideas and tagged entryway furniture, hall stands, hall trees, mudroom, mudroom furniture, storage bench, storage benches.